This plant is endemic to the British Isles, yet genetic evidence suggests that it is still evolving and at present is little different in its genetic make up from some others in the same genus. However it is recognisable in the field both by its time of flowering as well as morphological characteristics. 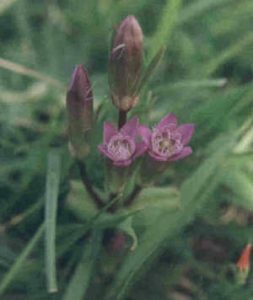 It is the earliest of the gentians to flower (in late May) but it does like sunshine so it is best to look for it on a sunny day. It is found on chalk grassland but is confined to four or five sites in administrative Oxfordshire. Being an annual its numbers vary greatly from year to year, but it can almost always be found on White Horse Hill.